But that's not why Thyra is threatening to shoot herself with a screw gun. Some of our most intrepid (and energetic!) voluteer helpers get down and dirty with the power saw, cutting boards to build the stage. got to the hotel (salami, bread, olive tapenade, and ceasar salad). would have space to settle in. bit of breakfast since we had a little time before class. Ballet), which felt very different. discoverd in class that our shoes sounded loud and felt slippery. disaster on a different stage. and it reminded us how fortunate we are to work for such a good boss. does the same and then we have a duet of the same length and pace. We're getting ready for the first ever OBT block party! Um, I mean Fall. Art. Live. It sounds like it's going to be a pretty fun day--- food, beer, performances, you can even take a dance class. A bunch of really inspired OBT staff spent last Friday doing a major cleaning of the building, from windows and mirrors to bathrooms and landscaping. Come out on Saturday and see how the place sparkles like I've never seen it. After my three-week stint as a Midwesterner this past July, my parents surprised me with a brief trip to New York City. After two weeks of Nebraska and a week of seclusion at a cabin in Wisconsin, I really looked forward to the bustle of Manhattan. Part of the reason my folks wanted me to go with them to NY was because of the residence that they've acquired when they travel East. 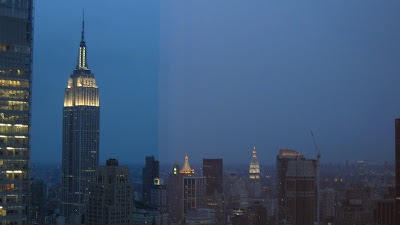 This is the view to the east from the 60th floor condo that they stay in for FREE whenever they travel there. 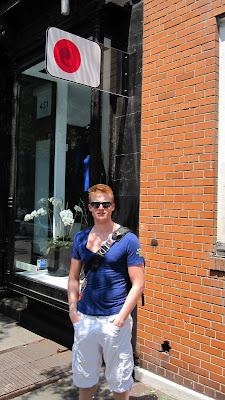 This was my fourth trip to NYC, and this residence was the most different of any other that I've stayed at in the city. The first two times I stayed in hotel rooms that didn't cancel out the noise of the city, and the third time I stayed in the dorms of the School of American Ballet. This was different because it was so quiet up on the 60th floor. And quiet isn't something that I associate with NYC. 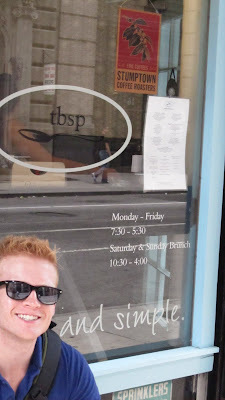 The next day I took class at Steps on Broadway with Willy Burrman. I was so stimulated by the dance environment of Steps that I forgot how long it'd been since I danced. Steps offered a grab bag of dancers: from stars of City Ballet and Ballet Theatre to people, like the woman I shared a barre with, who could very well be taking their first ballet class. I danced with the likes of City Ballet's Maria Kowroski, Teresa Reichlen, Tom Gold (former NYCB), Stephen Hanna (former City Ballet, current adult Billy Elliott on Broadway), Ballet Theatre's Jose Manuel Carreno, Julio Bocca (former ABT), and a handfull of Miami City Ballet dancers that I also recognized. And I actually knew two of the dancers in the class personally: one girl danced with me at a summer course at PNB a couple years ago, and one man was a dancer with the Omaha Theater Ballet when I was about 14. I approached him and said, "You might not recognize me, but I was a student in Omaha when you were in the company." When I shared with them that I was with OBT they asked how we were doing, as they'd heard about the Dance United benefit and our financial situation and wished us the best. After class I ventured to the Yumiko Store. Yumiko is a dancewear provider that's popular among the ballet community. Her work is generally only available online, but recently opened a store in NY. 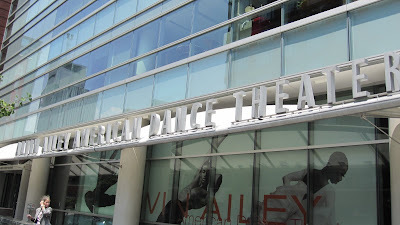 Just walked by Alvin Ailey's new dance studios, which are beautiful. Wished I could've had a chance to dance in them, but it was a short weekend. 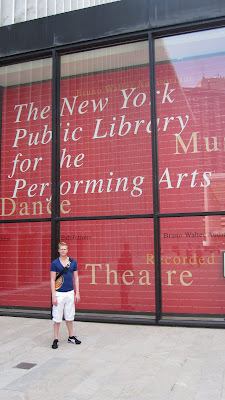 Spent a large chunk of time, and could've spent much longer amount of time, at the New York Public Library for Performing Arts. They had a terrific exhibit of the Diahilev and the Ballets Russe de Monte Carlo. Reminded me of our performances of Rite of Spring celebrating the anniversary of the company. Had some great clips of video, music, books, etc. showing how inventive, necessary, collaborative, and groundbreaking the short-lived Ballets Russe company was to 20th century ballet. For me, two of my most definitive ballet moments have been dancing in Balanchine's Apollo and Christopher Stowell's Rite of Spring this past March, and both of those works (Apollo in its entirety, and Stravinsky's compostion of Rite of Spring) were products of the Ballets Russe. 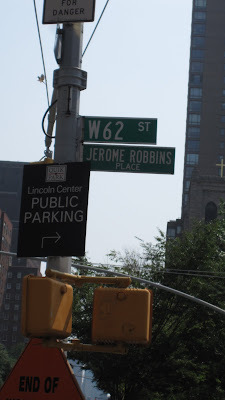 Snapped a shot of Jerome Robbins Place walking by it near Lincoln Center. Towards the end of the second day in the city, I was really pining for a taste of Portland. I mapped out a day to find a Stumptown Coffee. And luckily, Spoon came to our rescue. When we arrived there we asked if we could have our coffee "for here," and I've never seen a barista look so confused. "You want to stay here and drink your coffee?" she asked. "Yeah, we just want to sit for a bit," I said. "Oh...well, if you want to..."
I tried to be a New Yorker and blend in for the short time I was there: I referred to Manhattan as "the city" and wore dark clothes and walked quickly and pretended to know where I was going. But I think I was pretty unsuccessful at it. It reminded me that I am a northwesterner at heart, that I am glad to be back in Portland, and ready to celebrate 20 years of OBT. We all had a great time on Friday at what felt a little like OBT day camp. We packed up all our gear, trekked up to the park and spent the day amongst the trees, dancing under a stubbornly gray sky and using a tent as home base. The show went very well and I think everyone felt the glorious freedom that comes from dancing outside. When Steven said "come one, come all", I don't think any of us expected so many people to take him up on the invitation. The amphitheater was packed. All the green spaces you can see in the photo above were filled with people and picnic blankets. It was estimated that there were 3000 people there! Being able to watch the audience watch us as we perform isn't something that happens very often, and I find that it makes for a totally different performance experience. It's more casual, yes, but also slightly more nervewracking in that the potential for distraction and loss of focus is pretty high. I'll take that chance, though, for the fun of seeing all the little children dancing about at the foot of the stage! Performing with the musicians of the Portland Cello Project was a wonderful thing, too. Live music always takes a performance to new heights. Let's hope we can all do this again next summer! Hi everyone. As Gavin posted yesterday, we have a show coming up tomorrow night at the Washington Park Amphitheater. It starts at 6pm, it's totally free, and you can bring a blanket and a picnic if you want. We're splitting the evening with the Portland Cello Project and they'll be playing for Anne's ballet "No Sleep Lost." The cellists were in the studio today, so I thought I'd share some pictures with you from that rehearsal. Here are the wonderful cellists. There are more than 5 in the project itself, but these are the members playing for Anne's piece. Gavin, Adrian, and the Cellists. More from "No Sleep Lost." Later in the day we had a dress rehearsal in the studio since our stage time will be somewhat limited tomorrow. Also, we want to keep the costumes as clean as possible before the show, which is no easy feat when performing outdoors. Olga rehearsing her variation from Yuri Possokhov's Raymonda. Candace and Adrian in Nicolo Fonte's Left Unsaid. Mia and Brennan in Christopher Stowell's Eyes On You. So, if you love OBT, or Cellos, or even just an excuse to have a picnic, come on down to Washington Park tomorrow evening at 6. The studios are alive with company rehearsals again, even though we're still in the middle of our off-season. A small group of dancers is rehearsing Just (by Trey Mcintyre), which they are performing next week at the Chicago Dancing Festival. And another bunch of us are putting together a series of excerpts that we're going to perform this Friday in Washington Park, sharing a program in the annual concert series with the Portland Cello Project! Come on out and see us in an eclectic program of pieces ranging from Just (in its entirety) to Left Unsaid (you'll remember Nicolo Fonte's ballet from this past spring), some solos from Raymoda, three of the highlights of Christopher's Cole Porter ballet Eyes On You, and the official premiere of a new duet by Anne Mueller. Anne's piece will actually be performed WITH the cellists.